Derma Sciences Primer® Modified Unna Boot Compression Bandage is a 100% soft, otton gauze bandage that has been evenly impregnated with a non-hardening, zinc oxide paste. It is used in the ambulatory treatment of venous stasis leg ulcers and lymphatic edema, minor sprains, strains, fractures, thrombophlebitis and skin grafts on burn wounds. This bandage is packaged in a unique, vacuum-sealed pouch. 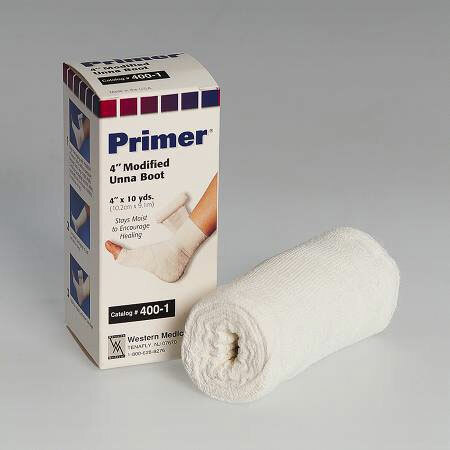 Derma Sciences Primer® Modified Unna Boot Compression Bandage is made with non-raveling, thread-locked gauze.